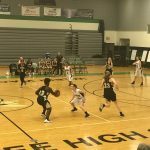 The Lady Hornet JV basketball team defeated Citrus High School 44-25 at Weeki Wachee High School. The Lady Hornets JV basketball team remains undefeated with a record of 7-0. Girls basketball will be having try-outs on Monday, October 30th at 2:30. All physical paperwork must be turned in by Friday, October 27th to be able to try-out. Physical packet are available in the front office.